The pore-formation activity of monomeric and oligomeric forms of different Cry1 toxins (from Cry1A to Cry1G) was analyzed by monitoring ionic permeability across Manduca sexta brush border membrane vesicles. The membrane vesicles were isolated from microvilli structures, showing a high enrichment of apical membrane markers and low intrinsic K+ permeability. A fluorometric assay performed with 3,3′-dipropylthiodicarbocyanine fluorescent probe, sensitive to changes in membrane potential, was used. Previously, it was suggested that fluorescence determinations with this dye could be strongly influenced by the pH, osmolarity and ionic strength of the medium. Therefore, we evaluated these parameters in control experiments using the K+-selective ionophore valinomycin. We show here that under specific ionic conditions changes in fluorescence can be correlated with ionic permeability without effects on osmolarity or ionic strength of the medium. 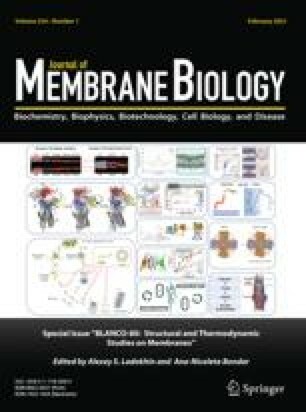 It is extremely important to attenuate the background response due to surface membrane potential and the participation of the endogenous permeability of the membrane vesicles. Under these conditions, we analyzed the pore-formation activity induced by monomeric and oligomeric structures of different Cry1 toxins. The Cry1 toxin samples containing oligomeric structures correlated with high pore activity, in contrast to monomeric samples that showed marginal pore-formation activity, supporting the hypothesis that oligomer formation is a necessary step in the mechanism of action of Cry toxins. Our thanks to Lizbeth Cabrera for technical assistance and CONACyT J44962Q for financial support.